Wild salmon is one of the delights of the late summer culinary calendar. It is the perfect food if you have a sensitive gut. Rich in protein, micronutrients and long chain fatty acids it is also very good for you. During late summer in the UK wild salmon migrates across the Atlantic and makes it way up fresh water river to spawn. Shortly after spawning the female fish dies. The young fish take up to 2 years to mature when they return to spawn in the place they were spawned themselves. They reach about half a meter in length. Their flesh is firmer than farmed salmon because they move around more allowing their muscles to develop. When you are buying filleted fish allow 150g per portion. Salmon is expensive and it is worth savouring. A fillet of wild salmon will cost about £3.50 – £4.00. This week I have teemed the wild salmon up with a lovely nutty mayonnaise which is made with soaked sunflower seeds and flavoured with whole grain mustard and fennel seeds from the garden. A few home grown beans, courgettes and a few slices of potatoes crisped in the oven make this a perfect, balanced meal. As a final garnish I added a handful of samphire which needs to be washed well in cold water and then steamed for about 7 minutes. If you cannot buy wild salmon, good quality farmed salmon will be lovely too. Drain the sunflower seeds and place in the bowl of a food processor together with the garlic, egg yolk and mustard. Process until the sunflower seeds form a paste. With the motor running gradually add the oil in a steady stream until a thick emulsion has been formed. Season the mayonnaise with salt and pepper and fresh dill or dill flowers. Process the mixture and taste again. Adjust the seasoning if you need to. Transfer the mayonnaise to the bowl and serve with the salmon. Preheat the oven to 200C/400 F.
Place a large sheet of foil on a baking tray and coat with a thin film of oil. Lay the salmon fillet on top of the foil. Season the salmon with salt and pepper and splash with a little dry white wine. 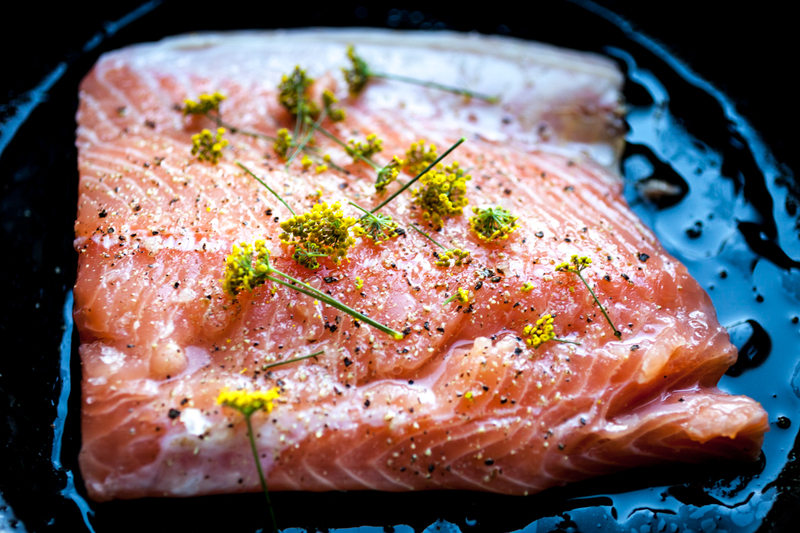 Scatter the aromatic herbs over the salmon and then gather the foil and make a tightly sealed parcel. Place the salmon in the preheated oven and cook for 10 minutes or until the middle of the salmon is just beginning to turn opaque. 31 Aug	This entry was written by Joan Ransley and published on August 31, 2015 at 4:48 pm. It’s filed under Dinner and tagged cooking, fish, healthy eating, low FODMAP, LowFodMap, Wild salmom. Bookmark the permalink. Follow any comments here with the RSS feed for this post.